and then relax with tea or coffee and lovely home made cake. 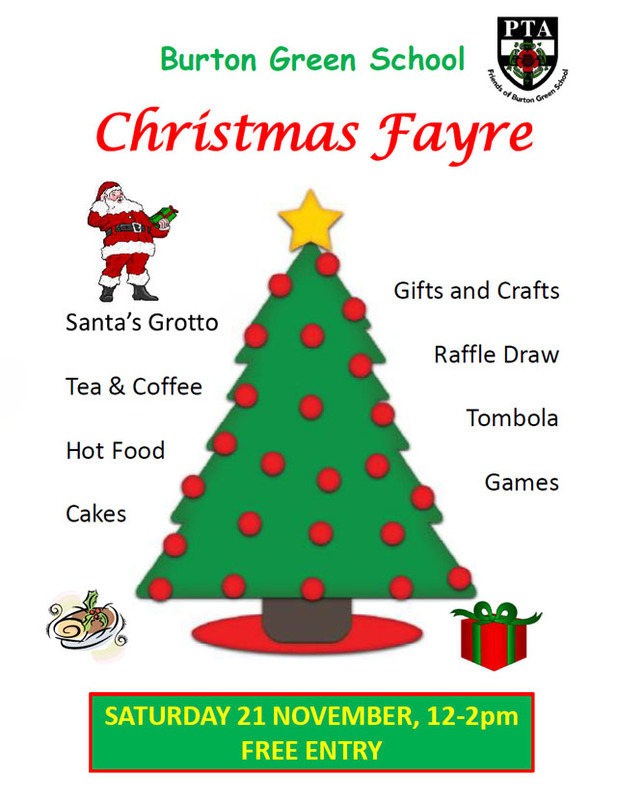 Please note that the Christmas Fayre being organised by Burton Green School (described on the flier below) is a different event to the Craft Fayre which is being organised by the Village Hall on the following day. Present: Hilary Cox; Andy Gibbs; Trish Hancock; Terry Heyes; Judi Hibberd; Janet Hickinbottom; Bron Putnam; Faith Ward; and Mary Webb. Trish was welcomed to her first meeting. Thanks were recorded to Alice Hawkins who had stepped down at the AGM. Apologies had been received from Diane Swindells; Rona Taylor; and Cllr. Caryll Green. Work had started on the problem areas of the footpaths in Red Lane but there was more to be completed. Mary would pursue this. Terry said there was not a lot to report. The recent Retired of Burton Green lunch did well. Overall about £500 had been made over two years even though the lunches were not intended to make a profit. Much of this had been ploughed back into dining equipment etc. The Village Hall fee of £194 for all the occasions it had been used was not yet recorded in the accounts. Terry had discussed with Peter Tacon whether the refund from the Mine Opposition Group should be ring fenced but it had been decided this was not necessary. The cost of ingredients for the 60th celebration cake at the AGM had been £39. Vicki Aizlewood who baked the cakes did not want payment for her time but asked for a donation to be made to the Village Choir. It was agreed that a donation of £30 would be given. The Speedwatch equipment was due for recalibration in December. The cost so far had been £238. Terry reported that the Parish Council and the Kenilworth Forum had agreed to share the recalibration cost. Terry said the Speedwatch team had been wondering about obtaining a small camera to assist their work. It was agreed to take advice from the police regarding the legalities of this before taking a decision. a Peeping Tom: a meeting had been held recently with the owners of the Hickory Smokehouse company which was looking into taking over the Peeping Tom. The meeting had been very heated with a number of residents, especially those living close to the pub, in opposition to the scheme. Complaints seemed to be against opening hours and outside eating (because of noise). Few residents had spoken in favour of the move even though it was believed many had no opposition and indeed some were in agreement. If the Hickory Smokehouse was not introduced the village might lose its pub. The committee decided that if individuals wished to express their support they should write their own letters and that the committee did not feel it could express an overall opinion. The suggestion to write individually in support (or in opposition) would be made on the email loop in case some residents wishedto do this. Mary would let Janet and Judi have the contact details of the Hickory Smokehouse manager. b Christmas tree. As so little interest had been shown in carol singing this wouldnot take place round a tree but it was agreed a Christmas tree should still be erected and decorated. Mary was contacting the various volunteers who helped with this task each year. She would also ask Diane to contact the supplier of the tree to see if one could be made available. It was agreed to of purchase s new set of lights at no more than £40. Andy also had some decorative lights which he would have tested first. c. Speedwatch. This item had already been covered. d. Broadband Update. Superfast broadband was now available to homes connected to the box at the Red Lane/Hob Lane junction. e. Retired of Burton Green lunch October 29th. This had gone very well and there had been many positive comments. The menu had been extended as it was the final lunch of the year. 37 lunches had been served with 5 takeaways. A shortage of red wine was commented upon! f. Youth Forum and Quiz October 29th. Only about 6 children had attended. It was decided a valiant attempt had been made to hold these events but they would not be continued. g. Red Land verge/ bank improvements. The footpath starting after the semis on the left hand side of Red Lane before the bends had become overgrown and was far too narrow for pushchairs. Mary would follow this up. h. Flower tubs. These had been replanted with bulbs, pansies and primula. Another tub had been placed along Cromwell Lane. Mary would ask Peter Hallam about strimming verges. i. The Jubilee Group event 2016. A meeting had been held with the head teacher of the school and discussions were taking place about a community picnic with games and fairground rides. A date of Sunday June 12th was suggested and profits would go to the school. It was hoped that funds might be made available by the Forum to help celebrate the queen’s 90th birthday. Andy said he needed to contact Ian about progress with the barrister. A letter about people's need to sell had been sent round the loop to ascertain whether the schemes were working. A newspaper article had also been sent round about the cost to the taxpayer of leaving properties vacant once they had been purchased by HS2. Andy said the locus standi hearing was to take place on 16th (for those who had petitioned on AP2 and been challenged). The Parish Council had agreed to a grant of £300. concern was the number of houses that Burton Green might be expected to accommodate as the former Local Plan had been rejected. Was the Burrow Hill site sufficient? As yet nothing was defined and the County Council was asking for sites. Mary suggested that the Children in Need Walk should be considered along the Greenway in 2016. The next committee meeting would take place on January19th 2016 at 7.30p.m.at the Village Hall.